Addis Ababa can be a challenging place for pedestrians. Sidewalks are narrow, uneven, or obstructed–if they exist at all—and drivers often fail to yield to pedestrians. This state of affairs is not just inconvenient, it’s dangerous. Almost 500 people die in road crashes in the city per year, and more than 80 percent of these are pedestrians. This number is expected to increase along with vehicle ridership. City officials have launched a number of initiatives to reduce traffic injuries and fatalities by half by 2023. One such initiative is the recently launched Safe Intersections Program (SIP) which will transform ten intersections per year over the next three years, making them safer and more efficient. Sebategna intersection was the first to be transformed under the program. 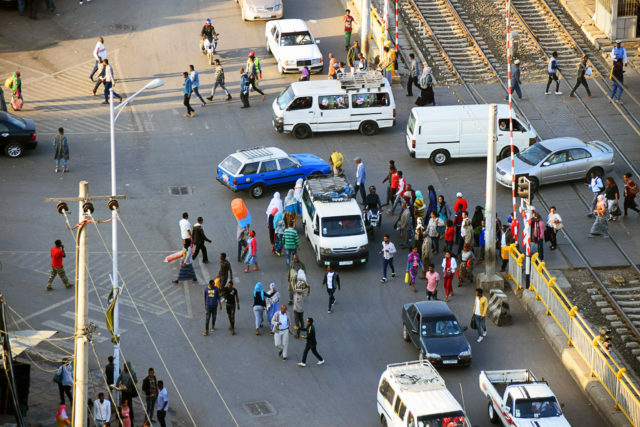 Located near Mercato, the largest market in Africa, Sebategna sees around 13,000 pedestrians each hour during peak times. In the past year, one pedestrian and one motorist have died at the intersection, while four people have been seriously injured. Before the transformation, the intersection lacked clearly marked crossings. Using new street markings, blue paint and hot pink planters, city agencies transformed Sebategna, tightening corner radii and adding pedestrian islands and walkways–design strategies that help to organize traffic and encourage slower turning speeds and safer pedestrian behavior, strategies that are detailed in our organization’s Global Street Design Guide. New crossings and pedestrian islands help to organize uses and improve safety. The change has been dramatic. Locals love the added color, and immediately reported feeling safer at the intersection. Vendors who had previously sold their goods from sidewalks now have plenty of space in the newly created islands, leaving walkways open for pedestrians. The interim transformation will be in place for six months so that the city can collect data to inform the permanent redesign. A similar phased approach will be used for future transformations, the next of which is scheduled for early 2018. 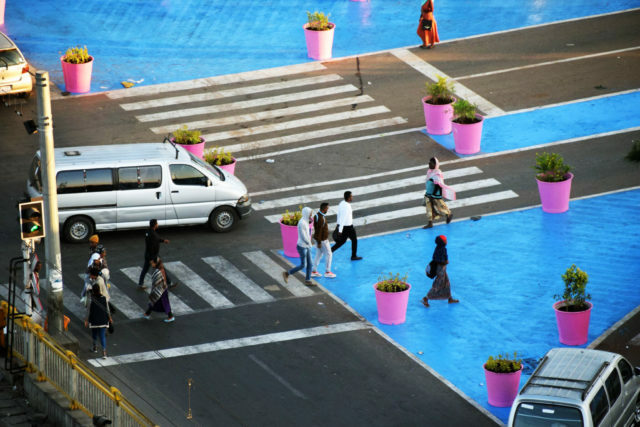 Using planters and paint, the intersection was transformed over the course of three nights. 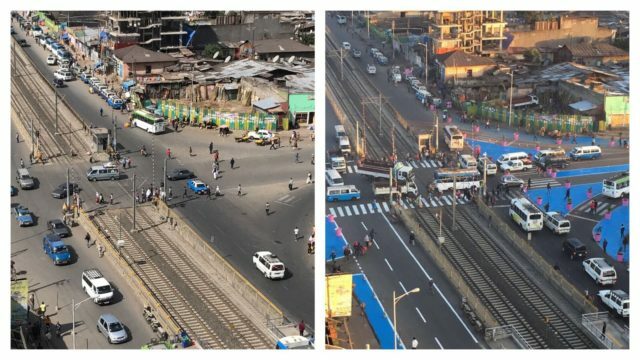 Sebategna intersection, before and after transformation. The Safe Intersections Program builds off the experience from a previously-transformed LeGare intersection. LeGare was redesigned with interim materials in December 2016 and permanent reconstruction is currently under way. 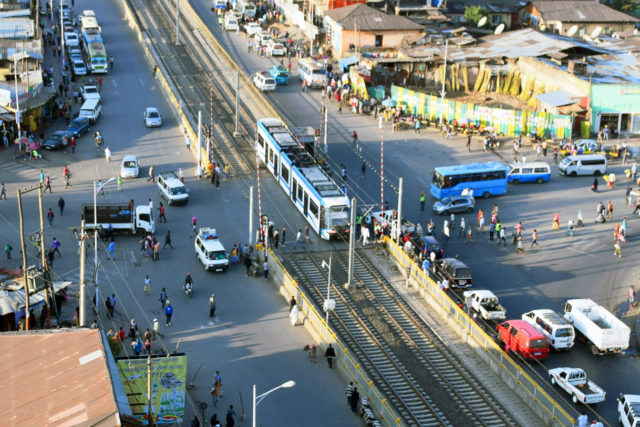 The NACTO Global Designing Cities Initiative is working in Addis Ababa thanks to generous support from the Bloomberg Philanthropies Initiative for Global Road Safety.